Writing biographies on other lives is a tricky proposition. In many ways it depends on the amount of access to a life you are allowed by others. In many ways, though, it also depends on your ability as a “literary” detective. Access and detective skills. Two key elements to create a biography. Of course there are others. It seems to me that one of the key requirements of a biography is selection. In other words, the biographer must focus on the most dramatic, critical time in the subject’s life. Forcing a focus is so different from the task of many biographers of simply replaying the years of their subject without giving more weight to certain times. The below represents a short outline of a screenplay I am considering writing on the life of John Coltrane. Much of it would follow my book Spirit Catcher: The Life And Art of John Coltrane (1995). I self-published the book in 1995 under the GreatHouse imprint and in 1997 it was awarded Best Biography by the Small Press Association. The book was more the book of someone discovering Trane for the first time. In the same way, that one might discover John Muir for the first time. Or Yosemite. It was never meant to be any definitive study on Coltrane. Just a type of journal notes of someone discovering Trane for the first time. My trip to discover Trane was different from most. In 1978, while living in the East Bay, I bought an album called Inner Voices by McCoy Tyner. The album led to many things for me. One was the creation of The Jazz Newsletter, a publication that published my thoughts on jazz at this time. Eventually, through the music of Tyner, I worked my way back to discover Coltrane. The ideas surrounding the creation of my biography on Coltrane were different from those surrounding most biographies. I had a few ideas on creating my biography of Trane. I read an interesting book about quotes from people who knew Coltrane. I put the quotes I liked into my notes. There was a book by a black doctor that was self-published. C.O. Simpkins. I could only buy it at Howard Books near the San Francisco Civic Center. At the time of all of this, I was living next to Berkeley and had access to the greatest record stores in the known world. There was Leopolds off of Telegraph in Berkeley that had every album you could imagine for prices like $1 an album. I had a plan for writing a story about Coltrane. I had read a lot about him but had not listened to a lot of music from him. I did know about the incredible music of McCoy Tyner and this was directing me back towards the music when McCoy was a member of the legendary Coltrane Quartet. Back to the music of John Coltrane. I had an idea for a new type of biography at this time. A new type of music biography. My idea was what if the biographer discovered the artist in through the various parts of his life. For the first time. The biographer would play the part of an embedded journalist. Reporting on the journey of the author through the biography of the subject. This is how I approached my Spirit Catcher book project. I decided to listen to the music of Coltrane for the first time in a chronological order starting in the early 1950s. I would not jump ahead to famous music of his I had heard about. Rather, I would listen to all of his music from the early 50s in a progression I would hear for the first time. So, the reporting quality of my little book Spirit Catcher hopefully shows through. It is meant much more as reportage than as definitive biography. The reportage of a person discovering Coltrane for the first time. I think the reporting nature of the book is it’s most unique feature. Anyway, I’ve enlisted the consulting help of the world’s greatest Coltrane scholar to look over my shoulder in this whole project of creating a screenplay. He has agreed to do so. The story below begins in 1950 and ends in 1967. 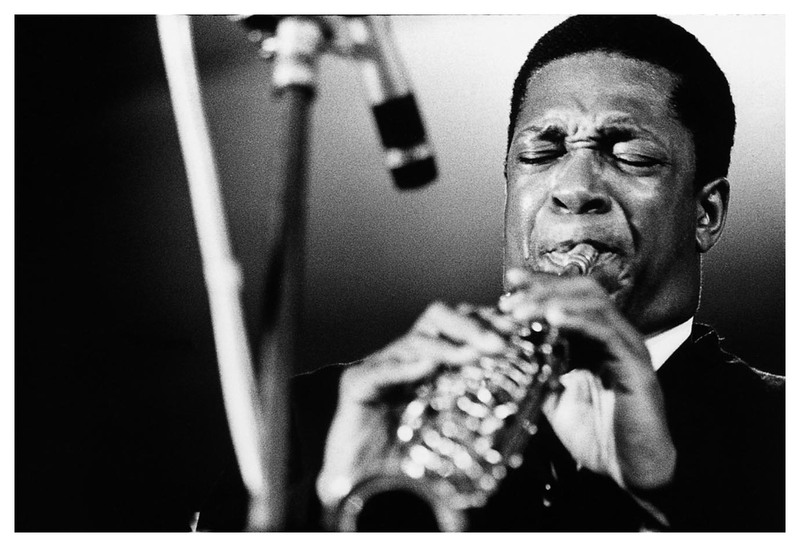 Seventeen years in the life of John Coltrane. Would it be best to narrow our story down to a fewer number of years? The thought continued to occur to me. I wanted to write a screenplay for a feature film on Trane rather than a documentary of his life. So, in this respect, it was important to focus on a particular period of his life. A series might come about later. The most important thing, it seemed to me, was giving the most dramatic representation to his life. Strangely, it seemed to mirror my own life at the time. His life was a dramatic life in itself without the need for dramatic representation. All of the screenwriting “tools” only seemed to distract from a powerful story. It needed to be told bare, by itself, without anything around it. So, I started writing Spirit Catcher in the basement of my home in the hills of my East Bay home. I had written something called The Jazz Newsletter for two years and had been volunteering my time with a new jazz group in the Bay Area called Loft Jazz. My full time job was working for one of the largest corporations in the world. After five years with the big corporation in San Francisco I left to start my own business. The biography Spirit Catcher was the first product of my new business called Pacific Marketing Strategies. The screenplay desires to use background on legendary albums like A Love Supreme and the Kahn book to recreate the mood and spirit around creation of this album. It will incorporate other books around legendary recordings Trane was part of. The below outline is a short outline. There is a much longer outline. But the below should serve to show the years we want to focus on. Perhaps we haven’t narrowed down the years as much as we should have? Apprenticeship under Gillespie, Bostic, Hodges. Let go by Hodges from heroin addiction. Working clubs in Philly with little known players. Working with Jimmy Smith when Miles contacted him. But could not get away from addiction to heroin. Becomes free of heroin and has spiritual awakening. Hears strange sound. Plays Five Spot with Monk. Second association with Davis and album Milestones. Living in a small house in Queens. Kind of Blue from Davis and Giant Steps from Trane. Trane leaves Davis and puts together his first group as leader for a date at the Jazz Gallery in NYC. Records “My Favorite Things” in October. Trane begins recording on the Impulse label. Records Africa Brass, then Ole Coltrane and Coltrane Live At the Village Vanguard. Becoming popular and Downbeat honors with Jazzman of the Year. Meets Ravi Shankar in December. Records Duke Ellington & John Coltrane on September 26, 1962. Records Ballads album. Leaves Naima for Alice McCleod. Records Impressions. Records Live at Birdland. Marries Alice. Records A Love Supreme. Letting young players sit in his group. Pharoah Sanders. Records Ascension. Hires Ali as a second drummer. Tyner and Jones leave the Coltrane group and Alice becomes pianist. Kulu Se Mama and Meditations released. Two more live albums recorded were Live In Japan and Live at the Village Vanguard Again. Records Interstellar Space on 2/22 and Expression (2/15 and 3/7). Dies in July.